Just hitting enemies in Dissidia isn’t enough to kill them – you need to smash them with the right attacks in the right order. Despite technically being a fighting game at heart, Dissidia Final Fantasy NT isn’t one to shy away from some of the more detailed complexities of the Final Fantasy series in its combat. Because of that nailing a kill in Dissidia NT isn’t as simple as just hitting enemies until they die – instead you have two different types of attacks to keep track of, plus skills, plus two different stats that relate to the aforementioned types of attacks. Sounds complex, right? In all honesty, it isn’t really that complicated once you understand and know it – but it’s not immediately clear the moment you pick up the controller. We’re old hands at Dissidia from the PSP days and we’ve also spent a fair amount of time with the new NT release in its beta form, so we’re prepared to explain the intricacies of Bravery Attacks, HP attacks, and how to down enemies to win a match. On this page, we explain all that stuff in detail. 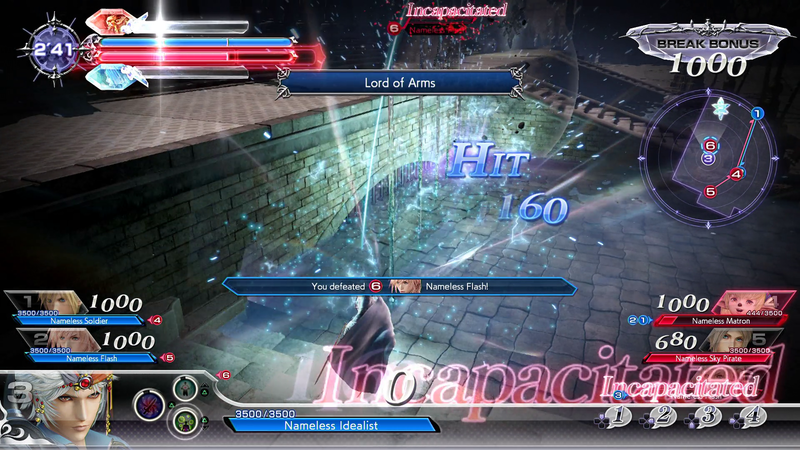 Dissidia Final Fantasy NT features two types of attacks – Bravery Attacks and HP attacks. These are represented separately on the HUD as mentioned in our Dissidia UI explanation guide – bravery is the large number in the center of your screen, and HP is the smaller number inside a blue bar underneath it, a more traditional health bar. Bravery, the large number in the bottom-middle of the screen, is the main stat you’ll spend most of a match focused on. Bravery represents the current damage you’ll do to an enemy if you hit them with a HP attack (which we’ll talk about in a moment) – so basically, bravery is the amount of damage you’ll do. Bravery defaults at 1000, though some summons, buffs and debuffs can adjust this. Bravery attacks are performed with the Cross (X) button, and when you hit enemies with bravery attacks their bravery will drop while yours will rise. This is a win-win – you make a foe less deadly and you power up your own match-winning HP attacks. The best possible way to win matches quickly in Dissidia is to aim to build up your bravery stat as high as possible by attacking enemies repeatedly with bravery attacks. Pressing X while holding the analog stick in different directions will adjust the types of Bravery attacks, and some can be charged by holding the button. Most characters have attacks to suit almost any situation, so experiment and learn what their tools are. The picture above depicts what happens when your bravery is so high that a single hit will defeat and knock out your current target. Look out for this purple glint on your character to know you’re ready for a kill and beware when enemies have it – it means they can one-shot you! If you can build to this level and land one HP attack, that’s a kill. Remember that when an enemy has this purple glint, the only way to make them less dangerous is to get in and hit them with bravery attacks of your own in order to lower their bravery stat. Dissidia is by design a very aggressive game, so don’t spend your whole match running! Bravery drops to 0 once you land a HP attack. Many characters have EX Skill moves where they can ‘share’ bravery with their team mates. An advanced tactic would be for a character like Cloud to build a large amount of bravery from a bravery attack onslaught, then transfer the built-up bravery to a teammate with a powerful and difficult-to-avoid HP attack so they can land the kill. Bravery will recover to its default value (usually 1000, but this can fluctuate) whenever it is below that so long as you can avoid enemy attacks. Depleting an enemy’s bravery entirely will put them into ‘Break’ status, and Breaking en enemy will also reward you the bravery Bonus displayed in the top right of the screen. When your bravery is suitably high enough or if you’re deciding to chip away at enemy HP with a variety of smaller attacks, you’ll want to perform a HP attack. These are pulled off with the Square button, and they too can be charged to fake out an enemy as to when you’re going to unleash an attack. Characters do have more than one HP attack at their disposal, but unlike bravery attacks you can actually only take one of them into battle. This is decided in the pre-match Battle Set screens, where you’ll have a choice between different battle sets with different HP Attacks and EX Skills. 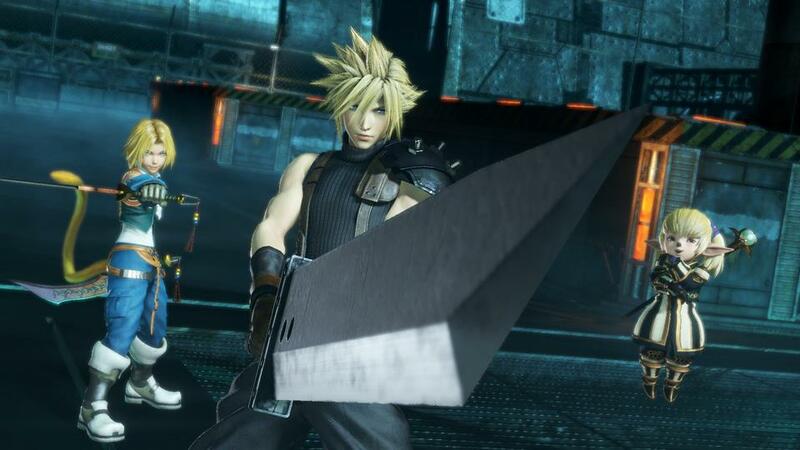 Many HP attacks will take the form of very iconic FF moves – Cloud has both Cross Slash and Meteorain, for instance, with the former an up-close attack and the latter a ranged affair. Remember, your HP attack will always do the damage equal to your current bravery value if it hits – and remember, once your HP attack hits your bravery will drop back to 0 and slowly recover back to the base of 1000 – at which point you’ll need to start building it again.